Sparked by an encounter abroad on holiday, I’ve begun to consider a phenomenon which has actually been a pattern of experience in my life. Whilst on its own not overly remarkable, when I consider how many times this specific encounter has taken place… it gets me thinking. So I’m walking down a street or round a store or anywhere in a public space and a man approaches me – okay, happens to a lot of women and non-binary people but wait, there’s more. Every single time, the man is a man of colour and every single time the man greets me with the Islamic salutation of “peace” – obviously spurred by my wearing of the hijab. Like I say, not overly remarkable, greeting fellow Muslims with this salutation is deemed respectful and actually prescribed as a part of living a good Muslim life. But there is an undertone. “How are you Sister?”, “Where are you from?” – maybe they’re happy to see a familiar face in a sea of white, maybe they’re genuinely concerned about me. But wait, we hear those excuses from almost all men who feel entitled to approach women – they’re just being friendly, etc. etc. Just as in the case of those excuses, here too I ask myself how many Muslim women greet me in a similar way, or how many men I “salaam”… Well you can guess the answer, and you can guess it because actually, what’s the big deal? 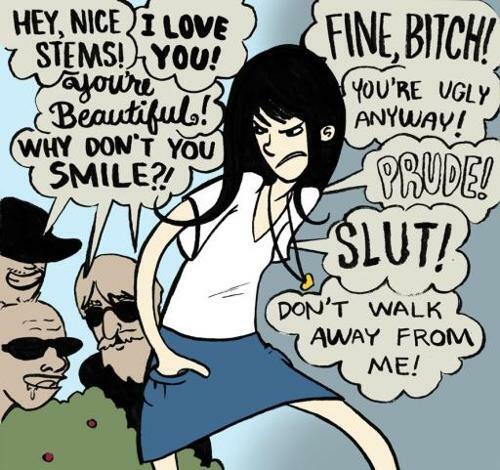 – This is a phenomenon of male entitlement in public spaces that has been well accounted for. But, here’s the thing: this only ever happens to me from men of colour, and specifically Muslim men of colour. I have never, ever, ever been catcalled, greeted, questioned, chatted to or etc in a public space by a white man. And on the other hand, if I am with white female friends and out and about when a man of colour approaches me in said way – the white friends are completely and utterly ignored, overlooked, erased. Spurred by the most recent of these encounters, I got thinking… what was going on here? Undoubtedly some sort of interaction of racism and sexism, but one specifically apparent in the case of presenting visibly and clearly as a hijab-wearing Muslim woman. The key factor seems, at least to me, to be the wearing of the hijab. Imperialist discourses and “othering” actually exclude me from mainstream images of the “type” of woman that is catcalled – primarily one not wearing a hijab above all else. A hijab-clad woman may be harassed etc but rarely approached in a problematic yet justified as “interested” way by white and privileged men. On the other hand, maybe as a corollary of racism that men of colour face from white women, Muslim men of colour specifically approach me as if I automatically belonged to them. Side-lined by one patriarchy as beneath street-forms of misogyny, the racialised and “islamised” patriarchy seems to pounce on the opportunity to suggest that women wearing the hijab are automatically “theirs”. Entitled to less than white men, I would argue that such men parade their male privilege in the arena of sexism. For instance, by using the Islamic greeting to open up conversation with me, suggests that we share a sphere of our own which thus entitles him to conversation with me. A layer of patriarchy where as a Muslim man of colour he suggests simultaneously that because I wear a hijab I “belong” to him and “his men”; and at the same time that we share marginalisation and “otherness” in the face of the mainstream. It is a confusing and complex phenomenon to articulate and one I have been wrestling with for several weeks now. Why is it that I don’t experience street harassment in the same way as non-hijab wearing women? And why is it that only a specific group of men target me in use of their male-entitlement? Maybe in this case it is useful to think of “patriarchies” rather than simply “the patriarchy”. Previous Previous post: Are we losing straight white men from the cause by calling them “straight white men”?